Finding the right chiropractor, massage therapist, or physical therapist is vital when you are pregnant. Our all-female providers are experts in natural pregnancy pain management. Our Omaha chiropractor and massage therapist care is a safe and natural approach for families managing pain and other health issues. Visit our family-friendly office for help with the whole family. We believe in our patients active lifestyles. The right Omaha chiropractor will put you on a path to the more active and pain-free lifestyle you desire. Call us now for a free consultation. We've Got the Omaha Area Covered for Chiropractic, Acupuncture, Massage Therapy, & More! Thank you for visiting the website of Omaha chiropractors Dr. Kate Hansen, Dr. Katie Dischler, Dr. April Johnston, Dr. Melissa Brown, Dr. Jessica Johnson Zortman, Dr. Connealy Cunnington, Dr. Amber Chohon, Dr. Hannah Beran, Dr. Amy Mick, and Dr. Sarah Santo Domingo. 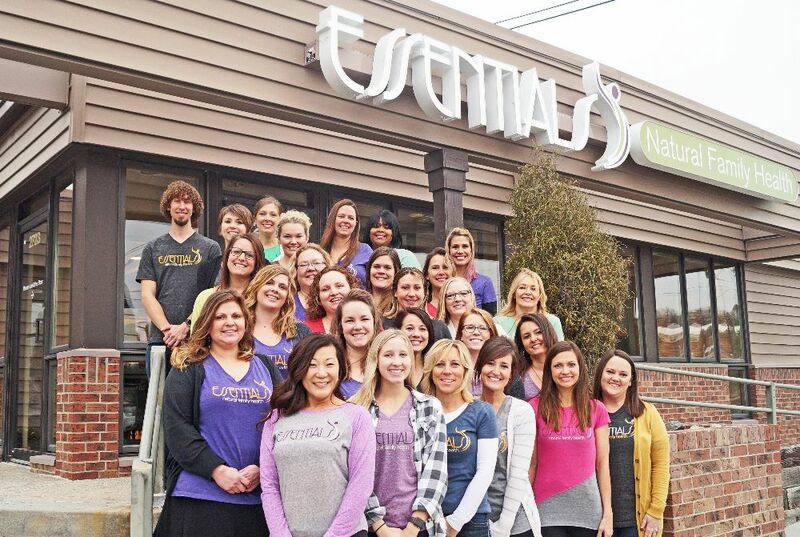 Essentials Natural Family Health is a professional natural healthcare full-service Omaha chiropractic and wellness clinic. We offer natural health care with Chiropractic, Acupuncture, Massage Therapy, and Physical Therapy and offer supplemental health services such as professional counseling, meditative classes and yoga. We specialize in Omaha families and Omaha pregnancy. Chiropractors Dr. Kate Hansen, Dr. Katie Dischler, Dr. April Johnston, Dr. Melissa Brown, Dr. Jessica Johnson Zortman, Dr. Connealy Cunnington, Dr. Amber Chohon, Dr. Hannah Beran, Dr. Amy Mick, Dr. Sarah Santo Domingo and licensed physical therapist Dr. Kelly Djernes as well as a staff of trained massage therapists and trained acupuncture professionals, strive for excellence through superior patient care, customer service, education and satisfaction. We specialize in back pain, headaches, and pregnancy pain in Omaha. Within our website, natural health patients will find all types of health and wellness-related information including information about our office and services, chiropractic, physical therapy, pregnancy relief options, back and neck pain, work and auto injuries and much more. Your Omaha Chiropractor is here to help with any pain-related issue you may be having. We are your chiropractor and physical therapist Omaha! So choose the right natural health professional, Essentials Natural Family Health. We are your Chiropractor Omaha, with a trusted staff that has gained the loyalty and friendship of our patients throughout our great city. Whether you are in pain from pregnancy, an auto accident, or any of life's challenges, our philosophy is to get you back to living a healthy and happy lifestyle. We hope you enjoy the information within and share it with others. Again, thank you for visiting www.myomahachiropractor.com and remember to come back often. We are the number one choice for Chiropractic, Acupuncture, Massage Therapy and Physical Therapy in Omaha.